This group is for sharing your art and let others remix your creations and experiment with them. The goals is to build the most amazing virtual world art ever, in a cooperative way! Virtual Worlds artists, Unite! 2. Remixers: if you want to play as remixer, you must use images offered for pileup by others, remix them and post on the group your own versions of the images. 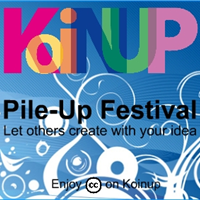 If you will play the as Artists, you have to have set the CC license "Attribution-NonCommercial"
This group is to pileup the best Koinup creations and experiment with your own artistic skills. Save to your hard-disk one of the images offered for pileup and create your own version. Describe your edits and mods and share your creativity with the other members.